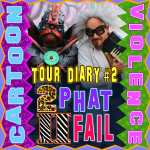 The band checks in from Las Vegas where they are about to play the Double Down Saloon on tour, to talk about their recent Portland shows and some Vegas memories. Also, Doctor Octave interviews Bjork. 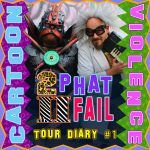 After four CA tour dates, Cartoon Violence reports from Portland about their tour experiences so far, their two upcoming Portland dates, and the rest of the tour to come. 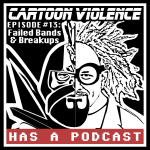 Journalist Aaron Carnes interviews the band Cartoon Violence about their podcast, music, and upcoming EP, and they all discuss their top 5 Winter songs. Petriform, a California electronic and chiptune musician, joins us for episode 19, including our top 5 rock songs – that is, songs about rocks! Mike Park, founder of Asian Man Records, discusses the indie record label business and his new project Kitty Kat Fan Club, plus we discuss our top 5 #catsongs in episode 18 of our podcast. Our old friend Random aka Mega Ran joins us this month to discuss his recent adventures, top 5 emcees, and what it was like switching from teaching to rapping full time.